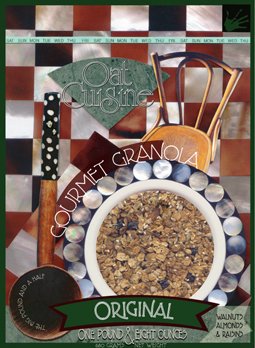 Linda Romine studied photography and graphic design in school, and now as a maker of granola, she enjoys using her artistic ability to make photo collages for her product packaging. 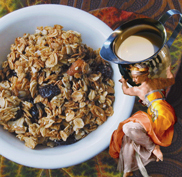 Once she had decided to make granola, she went for the top: the best ingredients in the tastiest combinations. She sold it immediately to four stores and the customer list began growing. The 'Original' was the first and only product for about nine years, mostly because Linda felt it was pretty much perfect. But market forces prevailed, and Cranberry, Oil-free and Ginger Pecan were later born.